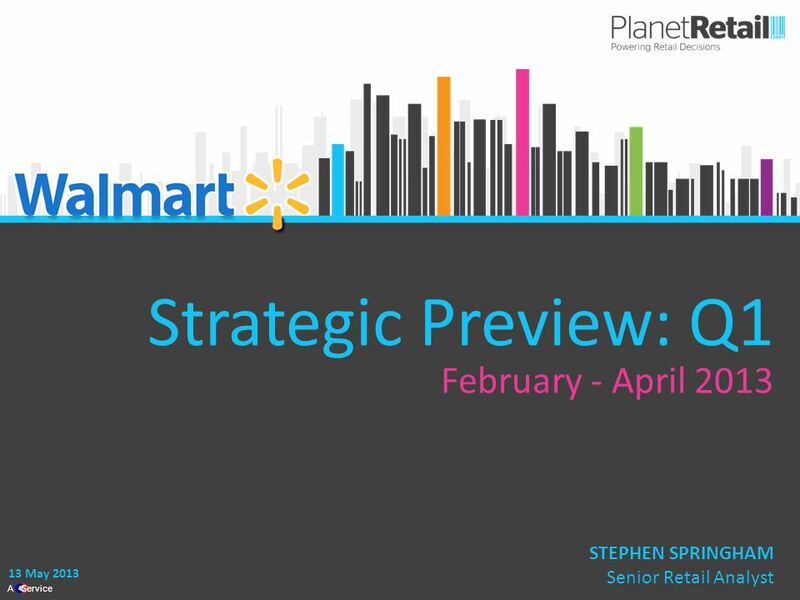 1 A Service Strategic Preview: Q1 February - April 2013 13 May 2013 STEPHEN SPRINGHAM Senior Retail Analyst. 5 5  A leaked trading e-mail overshadowed the Q4 results. Unsubstantiated rumours of President & CEO’s Mike Duke’s possible departure from the helm risk doing the same for the Q1 results.  Any speculation over leadership/succession should not deflect attention away from the wider issues. Domestically, the consumer and trading environment remains very challenging and the business will do well to even achieve its earlier prediction of flat comps in Q1. 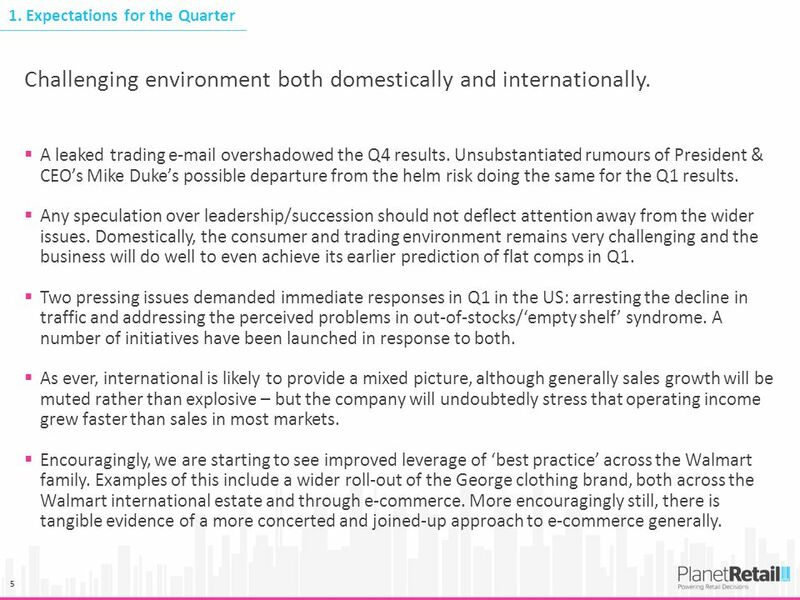  Two pressing issues demanded immediate responses in Q1 in the US: arresting the decline in traffic and addressing the perceived problems in out-of-stocks/‘empty shelf’ syndrome. A number of initiatives have been launched in response to both.  As ever, international is likely to provide a mixed picture, although generally sales growth will be muted rather than explosive – but the company will undoubtedly stress that operating income grew faster than sales in most markets. 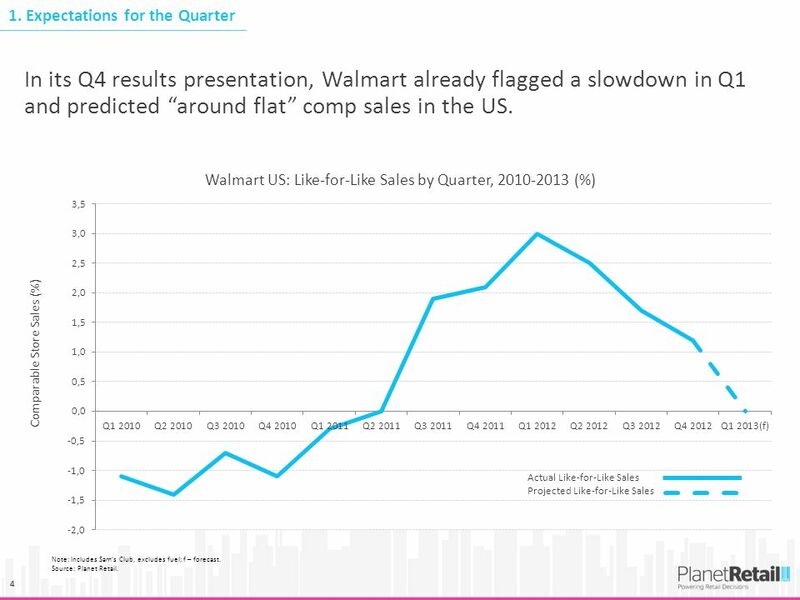  Encouragingly, we are starting to see improved leverage of ‘best practice’ across the Walmart family. Examples of this include a wider roll-out of the George clothing brand, both across the Walmart international estate and through e-commerce. More encouragingly still, there is tangible evidence of a more concerted and joined-up approach to e-commerce generally. Challenging environment both domestically and internationally. 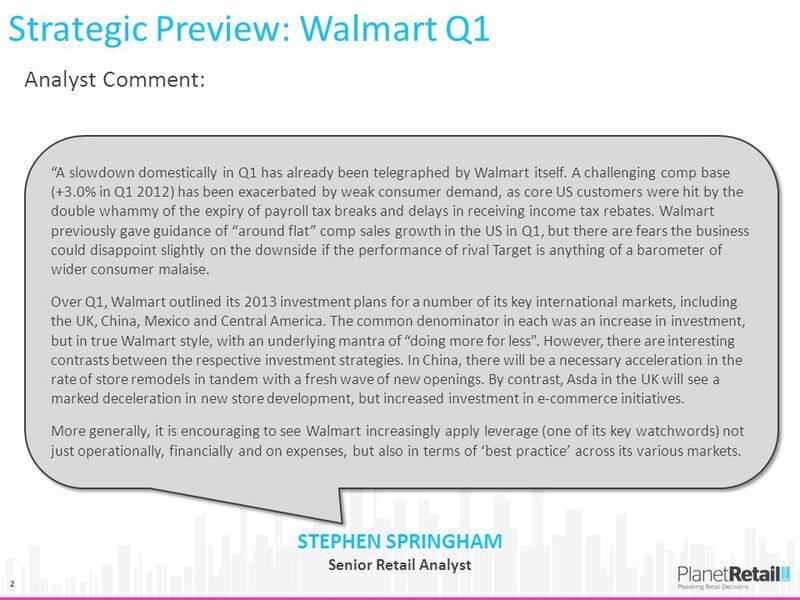 Download ppt "1 A Service Strategic Preview: Q1 February - April 2013 13 May 2013 STEPHEN SPRINGHAM Senior Retail Analyst." Verdict – 27 years of retail research Think Retail, Think Verdict. 1 Impacts of the Financial Tsunami on the Hong Kong Economy Government Economist 3 November 2008. 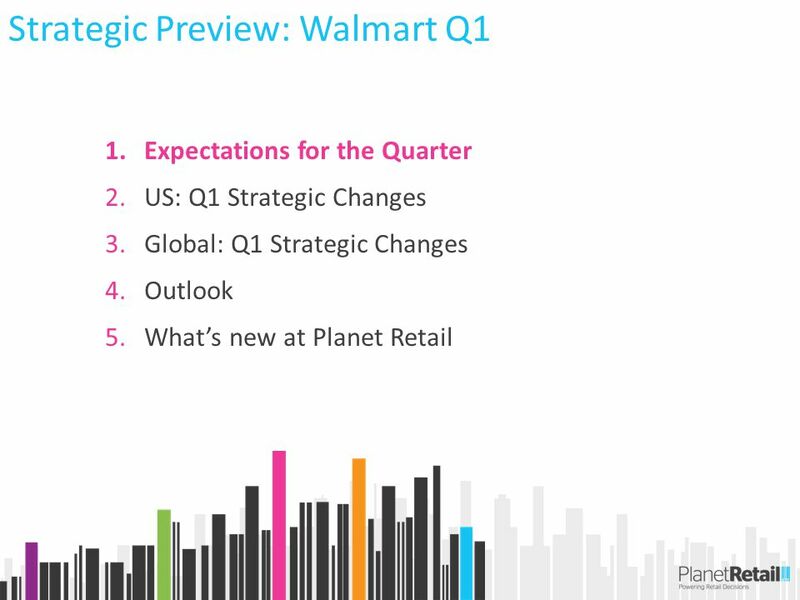 1 planetretail.net Strategic Preview: Q4 December February April 2014 David Gray Retail Analyst STRATEGIC PREVIEW. 1 A Service Strategic Preview: H1 February - September October 2012 DAVID GRAY Research Analyst. CRM – The Tesco Way. Tesco is a global grocery and general merchandising retailer headquartered in Cheshunt, United Kingdom It is the third largest retailer. Saudi Arabia Business Optimism Index – Q Presented by Dun & Bradstreet National Commercial Bank. 1 planetretail.net Strategic Preview: Q1 January – March April 2014 Gildas Aïtamer Retail Analyst STRATEGIC PREVIEW © Carrefour. Good case practices in lending and loan portfolio management Milan Dobeš Conference on Lending Standards January 31 st, 2014. 1 planetretail.net Strategic Preview: Q1 March - May June 2014 David Gray Retail Analyst STRATEGIC PREVIEW. 1 planetretail.net Strategic Preview: Q3 Aug 2013 – Nov December 2013 DAVID GRAY Retail Analyst. McBride plc : Interim Results 9 February 2006. 1 A Service Strategic Preview: Q3 September - November December 2012 DAVID GRAY Research Analyst. 1 planetretail.net Strategic Preview: Q2 May 2013 – August September 2013 DAVID GRAY Retail Analyst. 1 A Service Strategic Preview: Q4 October - December January 2013 GILDAS AITAMER Associate Analyst STEPHEN SPRINGHAM Senior Retail Analyst. 1 A Service Strategic Preview: Q4 November January February 2013 STEPHEN SPRINGHAM Senior Retail Analyst. Federal Reserve Bank of New York, Second District Project by Rodolfo Capiro Joseph Seifried Timothy F. Geithner President and CEO since November 17, 2003. 1 planetretail.net Strategic Preview: Q3 August - October November 2013 STEPHEN SPRINGHAM Senior Retail Analyst. Managing Your Own Business. Before you start a business Do the research: Make sure there is enough demand for your product or service, and speak to people. 1 A Service Strategic Preview: Q3 September – November 2012 13 November 2012 NATALIE BERG Global Research Director.